Thinking of travelling to St Petersburg by train? If so you've come to the right place. Going for a trip to St Petersburg by train from Helsinki, Tallinn or Moscow, can be one of the most convenient and remarkable ways to arrive in Russia. In short, an unforgettable experience. Photo of the trains Allegro, Sapsan and Tolstoy. Nowadays getting to Russia's Northern Capital by train is easier and faster than a decade ago thanks to the new high speed trains like the popular Allegro or Sapsan. The most popular routes for visitors are Helsinki to St Petersburg, Moscow to St Petersburg and Tallinn to St Petersburg, including the other way around, while the main rail operators connecting Saint Petersburg or Moscow to Europe are the Allegro, Tolstoy, Go Rail and Sapsan. All those trains run daily, are safe and modern, but different in price and service. According to our own experience we always recommend to take the Finnish train Allegro, if you travel from Helsinki to St Petersburg and reverse; the Russian train Sapsan, if you travel from Moscow to Saint Petersburg and reverse; the Estonian train Go Rail, if you come from Tallinn. These three rail operators are known to be better equipped, more comfortable and faster than all other trains in circulation, plus they offer a great English service on board. However, regardless of what rail operator you will choose, picturesque rural scenery awaits you! In fact, apart from relaxing, eating, drinking or do anything else you like on board of the train - you can also enjoy pine forests, lakes, rivers and Russian villages from the window. Having ourselves travelled to St Petersburg by train several times, we can assure you that taking a train isn't only a practical and cost effective way of travelling, but also a unique way to view the beautiful landscapes of the Russian countryside and those of the neighbouring countries. Interested in going by train to St Petersburg? If so keep reading below. If you are planning a trip to St Petersburg by train I am sure you would like to pick the right train. Below you can find all the trains available along with our favorites! The new high speed train Allegro (which replaced the old Sibelius and Repin in 2010) is operated by a joint venture between the state railways of Finland and Russia called “Karelian Trains”. Considered the most cost and time-effective way to travel between Helsinki and St Petersburg, this is your best choice if you want to travel from Finland to Russia in comfort and just in 3-1/2 hours. From Helsinki in under 3.5 hours, from Lahti 2 hours 45 minutes, from Kouvola 2 hours 20 minutes, and from Vainikkala in 1.5 hours. The train stops also in Tikkurila and Vyborg. For your information, the Allegro goes directly to St Petersburg Finland Station (Finlandskiy Vokzal) and operates four times per day with a range of electric tilting Pendolino trains (№151, №153, №155, №157). Please note that the departure/arrival time can be subject to change. The train Tolstoy isn't modern and fast as the Allegro but recently it has been refurbished, so on board you will find comfortable sleepers, a restaurant and even business class sleepers with a private shower. In comparison, inside the Allegro, you will find a folding table, Free WiFi, adjustable back rest, individual lighting, a socket between the seats for recharging mobile phones and laptops, a place for coats, a footrest and storage pockets for newspapers and magazines, plus a nice bar restaurant. The direct overnight Tolstoy train operates only once per day and stops in St Petersburg before arriving in Moscow. If you pick this train stay alert when approaching the imperial city as the train leaves again quickly. Please note that departure/arrival time can be subject to change. The train Go Rail is a passenger rail operator in Estonia operating services to Russia, so an alternative option to the bus if you land by plane in Tallinn. According to what we know it is a modern and well equipped train composed of first and second class cars with extra space between seats, Free WiFi, and a bar offering snacks, drinks and the latest newspapers. The train operates only once per day and it goes to St Petersburg and Moscow departing at 15.27pm from Tallinn, and at 06.55am from St Petersburg. The trip takes approximately seven hours if you go to St Petersburg, and 15 hours if you go to Moscow. 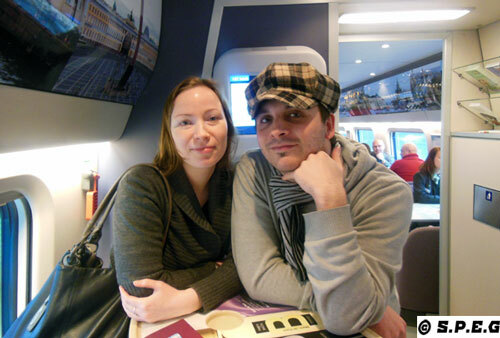 Another way to travel to St Petersburg by train is from Moscow. If you're there you can take Russia’s newest and most interesting train Sapsan. A new high speed electric train that bring you to St Petersburg in less than 4 hours, sometimes even quicker. The train offers extremely comfortable carriages with good seats (superior first class, premium first class, standard first class seats and second class seats). It has plenty of storage space and good coffee dock, including an excellent English speaking staff on board. Of course there are also other Russian trains to choose from that operate on the Moscow to St Petersburg and Moscow to Nizhny Novgorod routes. For example, if you want to try something different to reach St Petersburg by train you can take the historic overnight train Krasnya Strela and Red Arrow, two prestigious Russian premier trains in Soviet times, or take the Grand Express, a new privately-run luxury train, or the modern express Megalopolis, a new train operating since 2006. These trains have all great service starting with the more modest and efficient second class sleeper tickets to the quite luxurious first class and VIP tickets. However, they are more popular with Russians than with foreigners. You can guess why! Red Arrow and Krasnya Strela Train Timetable. St Petersburg has long been an efficient Russian rail hub, bridging the gap between Europe and Russia. St Petersburg has five major decorative train stations which are all connected to the metro and therefore very easily accessible from most points in the city. Only four of the five main St Petersburg train stations handle long distance trains. Vitebsk station (Vitebsky vokzal) is the destination for trains from the Baltic States and Eastern Europe. Long distance trains to Berlin, Brest, Budapest,Chisinau, Dnepropetrovsk, Gomel, Kherson, Kiev, Lvov, Minsk, Odessa, Prague and Smolensk. Suburban electric trains to Tsarskoye Selo (Pushkin), Pavlovsk, Oredezh. Finland station (Finlyandksy vokzal) - International express trains to/from Finland arrive here. Long distance trains to Sortavala and Kostomuksha. Suburban electric trains to Vyborg, Priozersk, Primorsk, Zelenogorsk, Vysotsk, Svetogorsk, Vsevolozhsk, Schlisselburg. Moscow station (Moskovsky vokzal) is the hub for Moscow bound trains. Long distance trains to Moscow, Adler, Akmola, Arkhangelsk, Briansk, Cheliabinsk, Kazan, Kharkov, Murmask, Novorossiisk, Omsk, Petrozavodsk, Samara, Saratov, Sevastopol, Volgograd, Vologda, Vorkuta, Voronezh and Yevpatoriya. Suburban electric trains to Volkhov, Malaya Vishera and Mga. Ladoga station (Ladozhsky vokzal). Built in 2003 on the east side of the Neva, it's the most modern station in Europe with electronics providing comfort, security and high level of service. Long distance trains within Russia depart from here. Suburban electric trains to Luga, Gatchina and Siverskaya. All railway stations have been recently refurbished, so now they look much better than in the past. Each train station has ATMs (bankomaty), money exchanges (obmyen valyuti), luggage-hold rooms (kamera khraneniya), toilets and cafes, and even automatic ticketing machines that you can use only if you understand the Russian language. If your plan is to travel to St Petersburg by train from Helsinki to St Petersburg with Allegro because you've planned to fly there, then you will arrive at the Finland station. This is where Lenin arrived in 1917 from Siberia and gave his historic speech. If you think to travel from Tallinn to St Petersburg because your plan will lands there, then you will stop at Vitebsk station. If you are travelling to St Petersburg by train within the country of Russia, for instance from Moscow to St Petersburg - the most popular route in Russia - then your final train station will be Moscow station. Generally the cost of the train ticket can vary by train class, travel distance, season or train berth (though is not as broad a price range as you might think). To give you an idea, a one-way trip from Helsinki to St Petersburg by Allegro costs €86 ($95) for second class, and €137 ($150) for first class, while on the other way around a one-way ticket in 2nd class costs €39 ($43), and €79 ($86) in 1st class. As you see the price is double when you buy your tickets in Europe (Finland), and cheaper when you buy your ticket in Russia. Please note that the prices given are just an estimation. Our St Petersburg by train trip with Allegro: Photo of the train ticket. On the other hand, a trip on the old Tolstoy train can cost you almost the same, though a ticket bought in Russia is always cheaper. In both trains, the price (according to the class) includes various services, such as drinks and snacks, newspapers and magazines, radio headphones, etc. The ticket price for taking the Go Rail is €36/$39 for a one-way trip in second class. If you choose to travel in first class, then the price is double. If you go with the Sapsan instead, expect to pay around $134/$208 - €122/€189 for a business class, or around $76/$112 - €69/€102 for an economy class. Overnight trains such as the Krasnya Strela or Red Arrow costs around €104 ($114) in spalny vagon (1st class 2-berth) or €52 ($57) in kupé (2nd class 4-berth), while for the Megalopolis or the Grand Express luxury train the fares start from €58 ($63). Please note that the prices given are just an estimation. For your information, children aged 6 to 16 (inclusive) travel at half fare. Children under 6 go free. Getting your Russian train ticket is quite easy but there are a few things you should know. You can easily and safely buy train tickets on line or at any central railway office station (open from 8 am to 8 pm Mon-Sat, and from 8 am to 4 pm Sun) at least two days before the departure; through special ticket offices or from travel agencies, but pay a mark-up of 10 to 50%. When buying your Russian train ticket remember to purchase the tickets in advance, especially to the popular destinations such as Southern Russia, Central Russia and the Trans-Siberian route. And don't forget to bring your passport as it will be requested - no other documents are acceptable (except for a Russian military pass or Russian civil servant card). For your information, booking opens 60 days before departure. Also, there are no open tickets for Russian trains - you will have to buy a ticket for a particular train on a certain date. If you decide to buy your tickets directly from the office station, but the Russian language is an issue, then simply pass the ticket lady a piece of paper with your travel details or ask someone who speak English to help you. Honestly speaking, the easiest way to buy your train tickets for Russia is online. If you need, feel free to search and buy Russian train tickets HERE. During the passport control you won't need to get off the train. Instead, they will check your passport on board. That's why is more convenient to travel by train than by bus. Since 2010 all customs and border checks take place on board of all trains (Allegro, Tolstoy, Go Rail, Sapsan, etc. So, when crossing Russian-Finland border or Russian- Estonian border make sure you have a valid passport and a Russian visa with you. Our St Petersburg by train trip: Photo of a security guard checking people's passport on board the train Allegro. 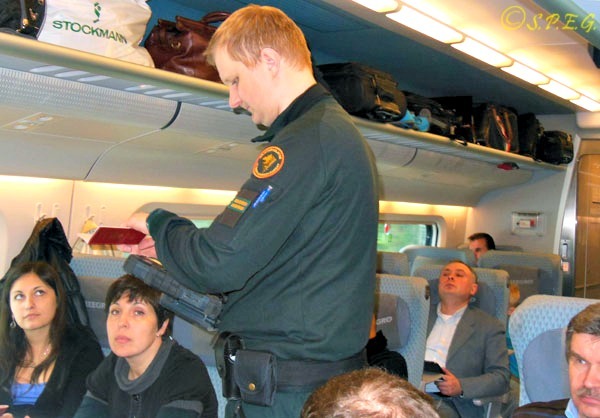 When you travel between St Petersburg and Vyborg, you will see the Russian border guards and customs officers (situated in the center of the train) moving towards head and end of the train checking the passport of each passenger, including yourself. This should take no more than one hour. Alternatively, Finnish border guards will check passes at the section between Vainikkala and Kouvola in Finland, while Estonian guards will check passes at the Narva border. However, if you de-train or take a train in Vyborg, then, you will go through customs and passport control at the railway station of Vyborg. This new scheme decreases the length of your journey as it reduces the stopping time in Vyborg and replaces the train stop at the border station of Buslovskaya. If you are travelling to St Petersburg by train passing through Belarus or Ukraine, remember that you will need a transit visa for those countries along with a Russian visa. Be aware that you can't buy tickets on board the train, but only a few weeks ahead in major Finnish or Russian Railways stations, travel agencies or online. In summer is the peak season for traveling and it’s better to organize your journey in advance. This also applies to late spring and early autumn. If you plan on traveling during these periods, it is important to book your tickets a few weeks in advance. The cheapest place to buy Russian train tickets is at the station reservation office. If you decide to buy tickets from the train station remember to take your passport, even if you only want a Russian domestic train ticket. To avoid language problems if you don't speak Russian, it's a good idea to learn the Russian alphabet, so you can write down the journey and date you want to show to the ticket office staff. There is no double pricing system for foreigners when buying train tickets. If you wish to travel to St Petersburg by train with Allegro, we know that by sending an email to Kansainvalinen.Lipunmyynti@vr.fi (VR customer service) the customer support of VR will book the tickets for you and you only have to pick them up on the day of departure. You can also reach them even through their website! When you travel to St Petersbusrg by train make sure you arrive at the station 30 minutes before the train's departure at the latest. Do not drink the water from bathroom faucets. Trains in Russia have hot, potable water from coal heated samovars on every carriage. Search timetables of Russian domestic trains in Russian Railways (RZD) timetable search. Please note that the Train Allegro no longer stops at Pasila. When you return from St Petersburg by train to Finland do not bring wild boar meat into the country! You should know that all import for gift or souvenir purposes of meat products is prohibited from Russia, Belarus and Ukraine. Avoid taking a taxi from the railway stations as you will most likely pay 2-3 times more than the regular fare. Therefore, it would be better to order a taxi beforehand, or just walk 5-10 minutes to the nearest St Petersburg metro: Pushkinskaya (Vitebsk station), Ploshad' Lenina (Finland Station), Ploshad' Vosstania (Moscow station), Ladozhskaya (Ladoga station). For your information, there is a taxi connection service for trains to Russia that operates between Lappeenranta (Matkakeskus) and Vainikkala railway station.